Cubalex, 3 April 2017 — The defense and promotion of human rights in the world depens on the work done on the ground by civil society organzations, documenting human rights violations. These organizations are the mediators between individuals and the State and an essential pillar for the strengthening and consolidation of democracies and the rule of law. Without civil society, there is no legitimate state. Lamentably its members often are exposed to dangers. Many times they are tortured and subjected to inhuman and degrading treatment, including murder. They are vulnerable worldwide, due to undue restrictions on freedom of opinion, expression, peaceful assembly and association. Of the 43 thematic mandates of the special procedures of the United Nations, the rapporteurs who deal with the exercise of these rights are those who send the most communications to the States. Cuba is no exception. These rapporteurs were the ones that sent the most communications, either individually or jointly, between 2011 and 2016. However, the Cuban State disagrees with the rapporteurs’ characterization of the people who make up the organizations that defend human rights in Cuba. The State considers it inadmissible that they should be recognized internationally as such and as a part of Cuban civil society. The State says that these human rights defenders aim to openly transgress the laws, undermine, subvert and destroy the political and social system, the internal legal and constitutional order, established in a sovereign way by the Cuban nation, acting against the purposes and principles enshrined in the International agreements on human rights. It asserts that they are everything from invaders to terrorists, hiding behind the mantle of human rights defenders. it states that they receive funding from the United States government to fabricate excuses that justify their policy of hostility, blockade and aggression against Cuba. The government denies the work of defending human rights on the part of informal civil society organizations, and discredits them, to increase their vulnerability. Recent photos of Cuban human rights activists during and after their interactions with police and state security forces. Cubalex, Havana, 16 March 2017 — In the two cycles of the Universal Periodic Review undertaken in 2009 and 2013, the members of the United Nations Human Rights Council recommended that the Cuban State ratify the Optional Protocol to the Convention against Torture as soon as possible and without reservations, and pass laws to make it clear in national legislation that torture as a crime. The Government took note of these recommendations, arguing that it ensured respect for the physical and spiritual integrity of persons and that it had effective national resources to ensure the rigorous implementation of the Convention. It added that international investigations confirmed that people residing in its territory enjoy the fullest protection and enjoyment of the rights and remedies established by international human rights instruments. It affirmed that there were no practices of torture and other cruel, inhuman or degrading treatment or punishment in the country. Consequently, it did not consider it necessary, to assume obligations with procedures and instances of supranational jurisdiction, for the processing of individual petitions. The treaty bodies responsible for interpreting and monitoring the application of international human rights instruments are not authorized to hear individual complaints from individuals with Cuban citizenship and residence. Cuba does not recognize their jurisdiction. Cubalex, 2 March 2017 – It is common for people living in Cuba, once they start school at about six and pass from one educational level to another, to join social and mass organizations. First, in elementary school, the Pioneers, and then, at age 14, the social and mass organization and later the student organizations. Once they start their working life they join the country’s only union, and the organization for their professional sector. Most do not have any assigned function, but they pay their dues. The rule is that everyone is integrated into several of the social and mass organizations — all of them the only ones of their kind in the country — according to their educational level, their professional sector or specific interests. Their lives, social and work, and that of their families depend on this integration and on participating in patriotic, political and military activities. “Revolutionary integration” violates freedom of association, which includes the right not to be forced to join an organization. It is a requirement to obtain a university degree, to get a job, or to ascend in the workplace, where one also is required to be integrated into political organizations. State institutions, including schools, demand and verify your membership. Sometimes directly, others through a business subordinate to the Ministry of the Interior. Security and Protection, or the organs of criminal investigation, coordiante with the social and mass organizations. For example, the administration of the Committees for the Defense of the Revolution (CDR), when a case is being investigated, provide private and intimate information and opinions, in many cases personal and subjective, that are later used by the prosecutor. In the sentences of the courts, in addition to the personal data, it is taken into account whether the accused person participates in activities “targeted or programmed by mass organizations” or whether the person publicly expresses disagreement with socialist principles. This determines whether he is good or bad person. “Revolutionary integration” is the mechanism of social control that allows the political group in power to establish systems of rewards and punishments. People who do not join these organizations for religious reasons, or who publicly express their political opinions, are condemned to work immobility, isolation and social discrimination. 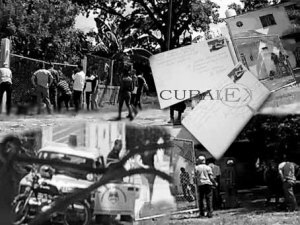 A montage of photos of Cubalex on the day of the police raid and mail from the people they help. Translator’s note: The references here to the empty offices and the inability to work relate to a police raid that occurred in September of last year, during which much of the organization’s equipment was confiscated. Cubalex, 20 February 2017 – It is an ordinary November day. Cubalex members are visiting the headquarters, the emptiness of the offices hardly bearable, their faces are not the same as before, but they continue to be united. “A letter has arrived,” says an assistant. “Read it out loud,” everyone says. “It is a new case, I don’t recall the name,” she affirms. “But start reading it,” exclaimed the investigator. The emotion was visible on everyone’s face, after so many days without being able to do our work this letter filled the space and all of us with emotion. It was the first pleasant emotion we had felt after more than 90 days of anguish. “A million thanks,” she continued reading, “love and blessings to you all, a thousand thanks for the help you can offer me, I have no way to thank you. I once again want to live. In you, I have found different human beings. “I will send you all the documents you asked me for, I am serving a sentence for a crime I didn’t commit, while the real culprit walks free. They accused me of the theft and slaughter of cattle, and condemned me to 12 years* and I swear to you I am innocent. “Soon I will turn 21, you are my best gift, just by responding to my letters. I was planning to go on a hunger strike, but I knew of Cubalex’s existence and the help you have given to many inmates here. May God always accompany you and thousands of blessings to you,” she concluded reading. “I have an envelope, and I saw that they left the stamps on the day of the [police] operation, you’ll find them in my drawer,” said the secretary to the assistant. *Translator’s note: the penalties for unauthorized slaughter of cattle in Cuba are very severe, and it is literally true that a person may serve more time for killing a cow than someone else serves for killing a person. Cubalex, Havana, 14 December 2016 – In Cuba there are no conditions under which economic, social and cultural rights can be exercised. “All Cubans have free healthcare and education,” is a claim that is easily refuted. We continue the debate with another question: Who decided we Cubans could not invest in a hotel or form joint ventures with the state? First absolute silence, then a bombardment of stones. In the end, Pedro threw a pea! The National Assembly and the Council of State are those who dictate the laws, he responded, doubtfully. “Have you read any law that says Cubans cannot invest in the national economy?” the professor asked. No, but the law is called “The Law of Foreign Investment” and it assumes that only they can participate in the national economy at the same level as the Cuban government. Is it fair? He asked again. No, he said. Do you believe it is a violation of human rights? He continued interrogating him. I don’t know, he replied, annoyed. He approached him and slapped his shoulder twice. Yes, the state excludes us, discriminates against us, he said, while looking at him and nodding. “We all have the right to equality and non-discrimination. It is a universally recognized right,” explained the professor while walking back and forth in the improvised classroom. The critics of this law call it Cuban Apartheid. Do they know this is a crime in the current Cuban Penal Code? I leave them to their first task: reading paragraph (b) of Part 1 of Article 120 of the Penal Code. Explain in 140 characters, that is in a Tweet, if the situation just described could define the crime called “Crime of Apartheid.” See you next Wednesday. Don’t miss it! Cubalex, Havana, 6 December 2016 – On Monday, María Victoria Machado González, mother of Danilo Maldonado, known as ‘El Sexto,’ petitioned the Provincial Court of Havana for a Writ of Habeas Corpus in favor of her son. In the petition, she asked the court to order the detaining authority to bring him before the court. ‘El Sexto’ (The Sixth), 33, was arrested on the morning of 26 November. In the early hours of that same day he had painted a graffiti on one of the exterior walls of the Habana Libre Hotel, after official media announced the death of Fidel Castro, 90. It is presumed that the arrest was carried out with violence. Witnesses said they forced his head between his legs. He was taken to 4 different detention. Currently he is in Vivac, in the Havana municipality of Boyeros. 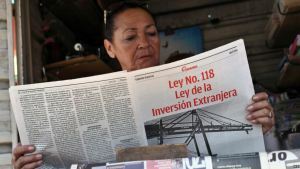 The authorities informed Maria Victoria that on 5 December, nine days after his arrest, the prosecutor decided to keep him in preventive custody. The investigation is being carried out by the criminal investigator Fernando Sanchez. Maldonado is accused of damaging state property. This crime is not mentioned in the Criminal Code. El Sexto’s mother also requested that the court order the immediate release of her son. The Criminal Code provides for a prison term or a fine for destroying, damaging or making unusable the belongings of another. This conduct does not correspond to Danilo’s actions. 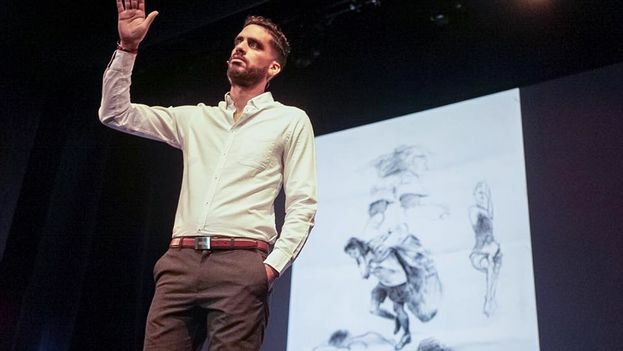 According to the petition, preventive detention of El Sexto is arbitrary and illegal. Painting the walls or facades of a hotel constitutes a violation against public adornment. Inspectors of the communal system are entitled to impose, in these cases, a fine of 100 Cuban pesos (roughly $5 US). 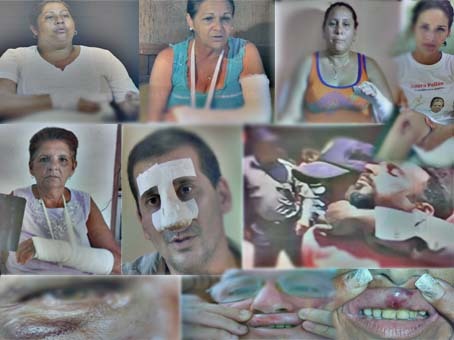 Machado González also reported that her son was beaten by a Major of the Guanabacoa police when he asked for medical assistance because of asthma. She adds that Maldonado made the decision to only eat the food brought in by his relatives. He suspects that the meals offered at the detention center have sleeping pills in them. 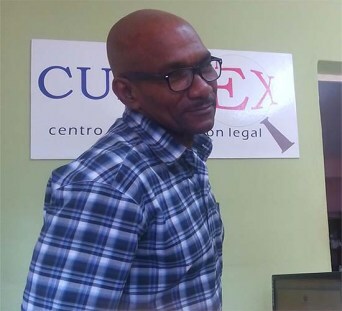 Cubalex Center for Legal Information, Havana, 15 November 2016 – The Cubalex Center for legal Information is initiating a campaign in support of Julio Alfredo Ferrer Tamayo, an attorney by profession and a defender of human rights by conviction. He has not emerged unscathed from his fight against the abuse of power. They have discredited him and acted against his wife. Today they are both in prison. He was charged in 2014 with the crime of falsifying public documents and in 2015 with the crime of contempt. He was tried and sentenced to 3 years and 6 months respectively. The National Directorate of Penitentiary Establishments recognized the violations of the Law, but they keep him in prison because they cannot go against a judicial decision. The Supreme Court did not acknowledge the abuse of power of its officials in bringing charges. The National Assembly and the Council of State listened and remained silent before the abuses. The sentencing court cannot change the decision, but prison officials allege that they have requested a correction of the combined sentence. There is no doubt, they are trying to resolve the abuses with more illegalities. Impunity is the order of the day. There is no intention to comply with the law, nor to punish those responsible for violating it. There is nothing left for state institutions other than to listen to reason, but they refuse to budge. Their violations can only be corrected through a review procedure which, according to the law takes about three and a half months, but Ferrer Tamayo has already waited nine months for a response from the President of the Supreme Court. Cubalex demands respect from the authorities for the National Law and asks anyone committed to freedom, democracy and human rights to join our campaign for the immediate release of Julio Ferrer. The Cubalex Legal Information Center is headquartered in Havana, Cuba. 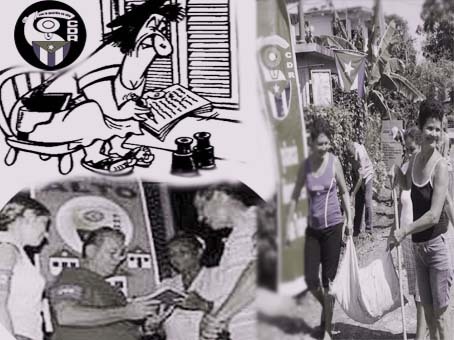 We are a non-profit NGO, not recognized by the Cuban state. We offer free legal advice in matters of legalization of housing, immigration procedures, inheritance, labor, processes of criminal review, constitutional procedures and the defense of civil and political rights, at a national and international level, to Cuban or foreign citizens who request our help.